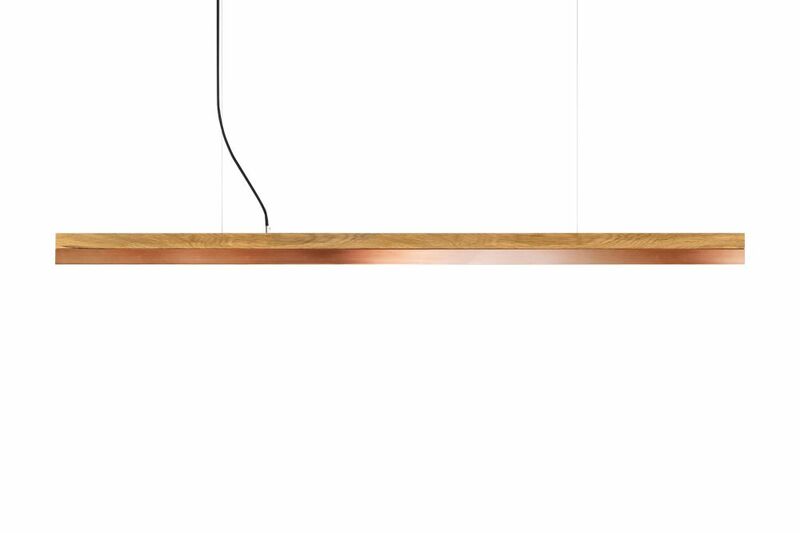 The rectangular pendant lamp [C] Oak Wood & Copper is made out of one piece of oak wood merged with a copper lampshade. The dimmable LED pendant comes in a length of either 92cm, 122cm or 182cm and a warm white (= 2700K) or cold white (= 4000K) light temperature. The rectangular pendant lamp [C] OAK WOOD & COPPER merges an oak wood lamp body with a copper lampshade, resulting in a timeless and elegant designer light. Designed by Stefan Gant and handmade in Berlin, the light is ideally suited for illuminating a long dining table, sideboard or desk. The dimmable LED unit is available in two alternative colour temperatures: Warm white (2700 Kelvin) and cold white (4000 Kelvin). Available lengths: 92cm, 122cm and 182cm. Please refer to the technical data section for more information about each version. Includes: LED unit, 2m black textile cable, brushed steel canopy, instructions and mounting hardware. Does not include: Wall / ceiling plugs (anchors).